Campbell Jones seems to have it all: an intelligent and successful dating therapist who is about to be given international recognition for her research into the father/daughter dynamic and how it affects a woman’s personal choices. Her study consists of workshops she’s been giving to small groups of middle-aged women back on the dating scene. Her latest group is made up of three women: Missi Morgan, who can’t seem to let go of a philandering spouse; Suzy Paradise, a self-proclaimed queen of online dating; and Felicity Starr, whose life and career are dictated by a controlling father. Along with Campbell, the women in her study learn to find their own paths to happiness as they begin to create new road maps for their happy-ever-after futures. Thanks. Happy weekend to you as well. I look forward to our online friendship. Thanks. Will see where it takes me. Hi Carol, I’ve only just seen your generous review of Unseen Unsung. Thank you so much. 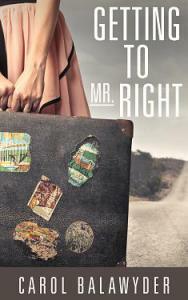 I have now bought the kindle version of Getting to Mr Right (I couldn’t get it from Amazon.com, but there is now a way through amazon uk). Given my pile, it may be a while before I get to reading it. I just finished “The Longest Nine Months” and left a review on Amazon. What a great read! I enjoyed getting to know the characters and the resolution (which I won’t share for those still reading or wanting to read.” I appreciated the length and the way you handled some tough subjects! I look forward to reading more. Congratulations Carol on a job well done!! I just was on Amazon and saw a review by Tall, which I presumed might have been from you. Am I right? Yes Ma’am that is me! Thank you so much for such a wonderful review. I am both grateful and appreciative of the time you took to write it. ❤ Wishing you a new year filled with delightful blessings.